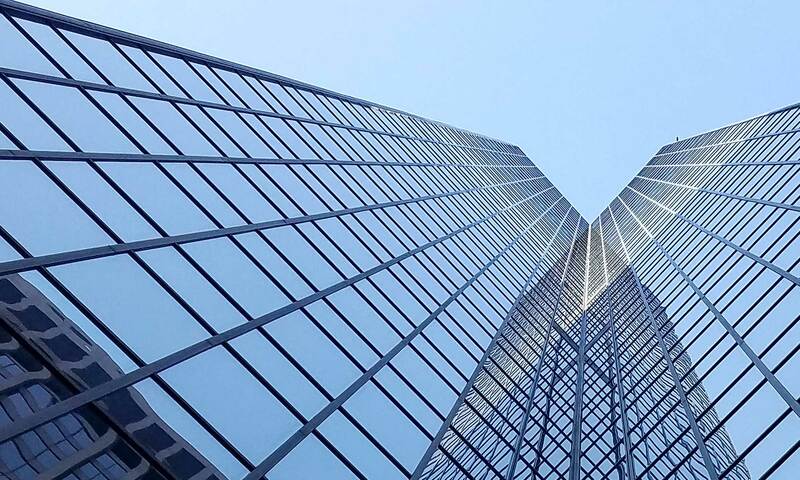 Technically, Microsoft does not support Windows Small Business Server (SBS) 2011 when it comes to backup using Azure recovery services vault (RSV). This is true even though Windows Server 2008 is supported and that is the server OS underlying SBS 2011. It turns out that the Azure Recovery Services Agent requires Windows Management Framework 3.0 – some of which is not compatible with Exchange Server and certain SBS console components. But, if you are NOT using Exchange and the rest of the issues will not affect your installation, it is possible to complete the install without breaking everything. Azure Recovery Services Agent running successfully on Windows Small Business Server 2011 when automated with a PowerShell script in Task Manager. First, install Windows Management Framework 3.0 manually. Second, install the Azure Recovery Services Agent. At this point you should be able to go through the Azure Recovery Services Agent (ARSA) wizard to connect to your RSV already created within Azure. And, when the connection is complete, you can run a manual backup to Azure. (Of course be aware that the first one takes a while if you have a bunch of data to push through a small to medium size pipe.) But eventually, you’ll discover that the tasks to do the backup regularly will not run without throwing errors and failing. This is so close to working that we dug further down figuring if it would run manually, we should be able to create some script to make it happen automatically. Well, you can! A blog post by Dan Stolts gives the background you need to get this going. There are PowerShell Cmdlets for Azure online backup that you can mix and match to create a PowerShell script for ARSA that get it to run successfully from a scheduled task. If you play around with the Cmdlets, you’ll discover that some of them work and some of them fail – an indication that you’re straying close to the edge – but the risk is well worth it. The key Cmdlets that do work are Get-OBPolicy and Start-OBBackup. 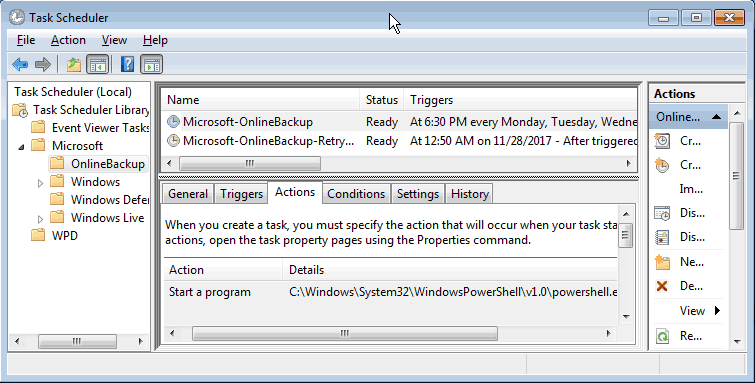 If you run “Get-OBPolicy | Start-OBBackup” from a PowerShell command prompt within the “\Program Files\Microsoft Azure Recovery Services Agent\bin\” directory you’ll discover that the agent fires up and does the backup successfully and exits without failure. An Azure Recovery Services Agent PowerShell script for automating backup to a RSV. So now, create your PowerShell script and then modify the scheduled task created by ARSA to fire off your script instead of the default action. 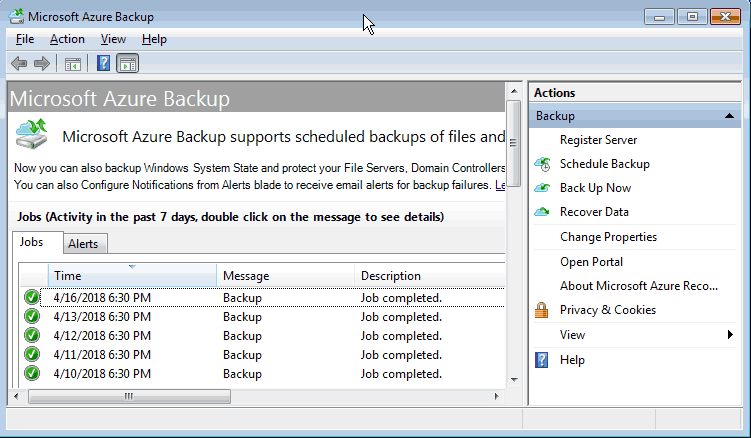 The scheduled task is at “\Microsoft\OnlineBackup\” in the Task Scheduler Library and named “Microsoft-OnlineBackup”. Make sure to keep a copy of your changes here because if you ever run the ARSA wizard again it will trash your changes and the automatic backups will fail. Azure RSA scheduled task needs to be modified to run your PowerShell script.